^ The CIAWorld Fact Book 2014. Skyhorse Publishing, Inc. (2013). ISBN 9781626360730. ^ Library of Congress – Federal Research Division (July 2008). 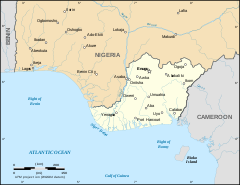 Country profile: Nigeria. p. 9. http://lcweb2.loc.gov/frd/cs/profiles/Nigeria.pdf 2011年12月28日閲覧。. ^ Olugbode, Michael (2011年2月2日). “Nigeria: We Are Responsible for Borno Killings, Says Boko Haram”. allAfrica.com. http://allafrica.com/stories/201102030036.html 2012年1月31日閲覧. "The sect in posters written in Hausa and pasted across the length and breadth of Maiduguri Wednesday morning signed by the Warriors of Jamaatu Ahlis Sunna Liddaawati Wal Jihad led by Imam Abu Muhammed Abubakar Bi Muhammed a .k .a Shehu claimed they embarked on the killings in Borno "in an effort to establish Sharia system of government in the country"." ^ 国民経済計算 Archived 2010年2月10日, at the Wayback Machine. ^ Why do women adopt their spouse’s names?, Sep 7, 2018, Daily Trust. Cooper, Andrew F.; Antkiewicz, Agata; Shaw, Timothy M. (2007-12-01). “Lessons from/for BRICSAM about South-North Relations at the Start of the 21st Century: Economic Size Trumps All Else?” (英語). International Studies Review 9 (4). ISSN 1521-9488. OCLC 7831301450. Müftüler, Meltem; Yüksel, Müberra (1997). Andrew F. Cooper (ed). “Turkey: A Middle Power in the New Order”. Niche Diplomacy: Middle Powers After the Cold War (London: マクミラン). doi:10.1007/978-1-349-25902-1_10. ISBN 978-1-349-25904-5. OCLC 6685155821.